Earlier in the year I wrote a post about Citi American Airlines credit card retention bonuses. For those of you unsure of what a retention bonus is, I’ll explain. A retention bonus is an offer that the credit card companies make to a card member to keep them from closing their account. The offers could be a lower interest rate, miles, waiving the yearly fee etc. To get a retention bonus, you (the card holder) call customer service and explain that you want to close your account (or are thinking of closing the account but want to know what offers are available). I always explain how I am getting better offers from other credit cards and mention examples like 3x gas, 2x groceries etc. Last week I was doing a little credit card maintenance. I was able to open 4 Citi AAdvantage credit cards around a year ago and figured that it was almost time to close some out. Before doing so, I figured that I could squeeze a few thousand more miles out of each card. I decided to call the Citi Retention Line for three of my cards. It turned out that I had closed one of my cards earlier in the year (I forgot to put it in my cancelled pile) so I was now down to two shots at a bonus offer. It was a no-brainer. I went with option #1 for both cards. For $1,000 in spending I will earn 7,000 miles. This is a great offer which will earn me 7 miles per dollar! I’ve cancelled credit cards and had annual fees removed many times after the fee had posted to my account. I never knew if there was a set amount of time given to have the fee removed. I usually just make sure to call and cancel (or ask for the fee to be removed) a few days before the bill is due. When accepting my retention bonus terms, I found out that we have 37 days from when the billing cycle ends to call to close the account and have the annual fee removed. The $1 coin free shipping deal has been over for quite some time and now it seems that the government will stop automatic production of them. ﻿Stopping production should save the government $50 million a year supposedly. For those of you unfamiliar with the US Mint $1 coin free shipping program, here is a short explanation. To help get $1 coins into circulation, the mint offered free shipping on orders. In the beginning you could order an unlimited amount of coins but due to people abusing the program it was lowered to $1000 per order. Some of you might wonder why anyone would order $1 coins, free shipping or not… Well the answer is simple- airline miles or credit card points. By charging $1 coins with free shipping, you could earn free miles by bring the rolled coins right back to the bank after receiving them. Another reason would be to hit the needed spend to earn credit card bonuses. Some cards might give you 50,000 miles as a sign up bonus, but you have to spend $5,000 in 3 months to get it. By ordering coins, once again you could hit your spend without actually spending money out of your pocket. The mint did not create this $1 coin program to have people order the coins to bring back to the bank but that was what many people did. They hoped the coins would be spent and then put into circulation. I only placed 4 orders from the mint. I did a couple for $500 and a couple for $1000. I tried to spend the coins when possible but did bring a few rolls to the bank at times. I think the most I ever brought back to the bank at one time was 4 rolls ($100). At times the tellers would give an odd look and even ask where I got the coins from. Spending the coins could be a pain. Lots of times, cashiers would not have a clue what the coins were or if they were real money. Some shops would refuse to take payment by $1 coin. When gas stations started charging a cash & credit price, I started paying for gas with $1 coins to get the cash price. Most stations did not mind getting one or two rolls of coins but some did not accept them as payment. Street vendors and food trucks were usually happy to take $1 coins since they were always short on small bills. I also used them to leave tips at cash only restaurants. 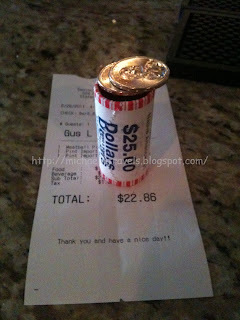 One time I paid for lunch which was $22.86 with a roll of coins plus a couple extra since credit cards were not accepted. The bartender that I gave payment to shook his head and laughed! Are Citi American Airlines Retention Bonuses Still An Option? I currently have a few Citi AA credit cards active and don’t really have a need for some of them. Before closing a Citi card, I always try to get a retention bonus. A few months back instead of closing one of my cards I received 3,000 bonus miles and an offer to earn an additional 750 miles for spending $750 or more per month for up to 16 months. Not a bad deal if you ask me! I have another older card that I’d like to cash in for a retention bonus but have had no luck with my calls after two tries so far. Each time I was placed on hold and the rep could not reach a retention specialist. I was told that I have two options- close the account or call back. I’ve been going with the call back approach and am now hoping that the third time does the trick! I am going to keep trying until I am given a flat out “no” to giving me a bonus to keep my business. For personal cards you can reach the Citi Retention Line at 800-444-2568. For business cards just call the # on the back of your card & you will get transferred if you are lucky.